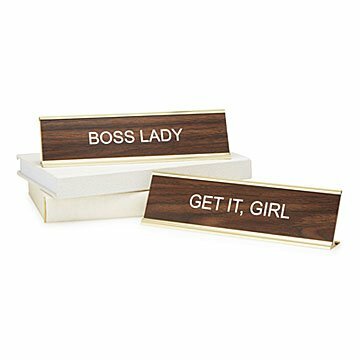 These playful plaques are a reminder that a woman's place is in the corner office. Great for status quo shaker-uppers and glass ceiling smashers, these progressive plays on classic desktop decor are nevertheless-she-persisted statements. The retro-styled signs work overtime to offer daily declarations that a woman's place is in the corner office. Made in Covina, California and St. George, Utah. Signs don't make the boss...but they help. This was for my daughter who is a grad student and runs a dorm. Lot's of sniveling helpless college kids around for her to command. I didn't want to go the whip/riding crop route...yet, and settled for a sign. She loves it. I am very excited to give this to a friend who happens to be a successful realtor. I know she will love it. The only downside is that the item just comes wrapped in plastic. For the price I was expecting it to come in a small box.